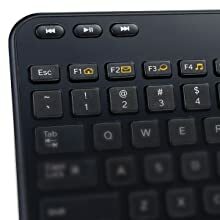 The compact, convenient K360 Wireless Keyboard in black from Logitech employs a tiny leave-in receiver that plugs into the USB port on your Windows-based laptop. It features a space-saving design, familiar keyboard layout, and 3-year battery life with instant access to music, email and more. As the perfect laptop companion, the K360 lets you type in comfort while taking up minimal space. The legs allow for keyboard tilt adjustment while the rubber feet keep the keyboard from slipping while in use. Give your workspace a makeover with this space-saving wireless keyboard in breakout styles from Logitech’s new 2012 Color Collection. With its compact design and easy plug-and-play wireless connection, you get a keyboard that’s beautifully convenient. Six hot keys and 12 programmable F-keys give you instant access to your email, favorite sites like YouTube, play/pause, volume and more. – Add a compatible wireless mouse without the hassle of multiple USB receivers.